The Network Member function offers a very customer friendly way to access the computers in your business and at the same time a minimal administrative effort. A customer who wants to access a terminal in your business becomes a Network Member. This means he gets an account with a Network Member Name and Password, which TimeWatcher will print out on a so-called Network Member passport. Once a customer became a Network Member, he can purchase time, which is credited to his account. This time can be used on every computer in your business in as many sessions as the customer wants. The Network Member (=customer) just has to enter his name and password at a client computer to unlock it. TimeWatcher will subtract the period of time for which the customer was using the computer from the customers account. 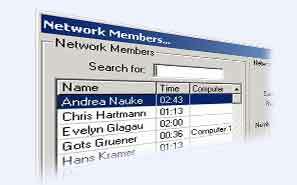 TimeWatcher displays the status and the remaining time of all Network Members of your business in the Network Member Dialog. TimeWatcher makes it even possible to have advertisements printed on the Network Member passports, which can be an additional income. The only work which is left for the supervisor in your business is to create and recharge the Network Member accounts. The Network Member process is graphically described in the Screenshot section of this website.